When a multicomponent liquid stream undergoes a sudden decrease in pressure (by, for example, flowing through a valve), part of the feed vaporizes. The vapor product is richer in the more volatile components (i.e. those with a higher equilibrium constant) than the liquid product. 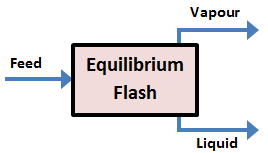 This is known as an equilibrium flash, and is the basis of many unit operations in the process industries, including distillation. This Excel spreadsheet implements an isothermal multicomponent equilibrium flash calculation. The spreadsheet includes a set of chemical components as the input feed (i.e. the molar amount in the feed stream, together with their K-values), but these can be easily modified. where zi is the mole fraction of component i in the liquid feed, Ki is the equilibrium constant (at the appropriate temperature and pressure) and β is the fraction of feed that is vaporised. Obviously, β is between 0 and 1. We then solve the Rachford-Rice equation iteratively. All you need to do is find the value of β that makes the Rachford-Rice equation equal to zero using Excel's Solver function. See the screengrab below for specific instructions. I'd like to point out that the calculations for moles in the liquid and vapor phase are off. Your current calculation doesn't take into account the effect of the K-values on the concentrations of the vapor and liquid phases. Otherwise, I think this is a nice spreadsheet. Very concise and easy to use. Keep up the good work. hi samir, but the K-values can be obtain from De Priester chart K-values for hydrocarbons.